BACKGROUND: Currently, globalisation, economic uncertainty and fluctuating market demands prompt leaders all over the world to improve their operations and to enhance innovations in processes, products and services in a very reactive manner. Literature shows that the adoption of an integrated Lean Six Sigma tool can assist them to compete with the rest of the world in a manner where productivity, quality and operational costs reduction are crucial for economic success. AIM: This article investigates the integration of Lean and Six Sigma tools as a unified approach to continuous improvement and develops a Lean Six Sigma framework for selected automotive component manufacturing organisations in KwaZulu-Natal (KZN), South Africa. METHOD: The quantitative methods of research were adopted. The target population (42) was organisations within the Durban Automotive Cluster of which five were used for the pilot work. An empirical study was conducted using a survey questionnaire in measurable format to gather practical information from the sample organisations on the status of their existing business improvement programmes and quality practice. RESULTS: The results of the study demonstrated that the organisations had a very low success rate of Lean and Six Sigma adoption as standalone systems, as they found it difficult to maintain the transition from theory to practice. CONCLUSION: Hence the adoption of an integrated Lean Six Sigma approach was absent and it can be concluded that the proposed Lean Six Sigma framework affords the KZN automotive sector a unique opportunity to integrate and operate with both tools of quality that complement its management style and industry demands. South Africa appears to be 20% more expensive than Western Europe and is 30% - 40% more expensive than China and India as an automotive manufacturing base. The main contributing factors that accounted for these challenges are the development and retention of a skilled workforce, insufficient knowledge of competitors and operational inefficiencies attributed to internal process problems (Naude & Badenhorst-Weiss 2011:96; Strauss & Du Toit 2010:304). Brand Pretorius, former president of National Association of Automotive Component and Allied Manufacturers (NAAMSA), reported at the 2011 Car Conference that the automotive sector in South Africa is a centre of excellence and a strategic asset for the country and should therefore consider adopting a more robust business model to adapt to the changing environment (National Association of Automotive Component and Allied Manufacturers [NAACAM] 2011:4). This is supported by Ndaita, Gachie and Kiveu (2015:683) and Nunes (2015:896) who suggest that globalisation and volatile market dynamics in the new millennium prompt organisations from every industry to adopt specific business improvement techniques to strategically enhance their operational excellence and management philosophies in order to gain competitive advantage and to maintain a share in the market. Literature shows that one such initiative that can assist organisations in eradicating the competitive challenges in the global and changing environment is the integrated Lean Six Sigma tool which has recently been recognised as the most effective business improvement technique that provides the experience, concepts and methods to lead change and sustain global competitiveness (Albliwi, Antony & Halim Lim 2015:665; Byrne, Lubowe & Blitz 2007:5; Snee 2010:12). It is a technique that originates from synthesising standalone Lean and Six Sigma systems into a unified approach to increase process performance. Organisations that attempt to deploy Lean Six Sigma effectively can generate substantial savings annually, as experienced in a wide range of leading industries that include chemical, automotive, finance, electronics, and health care (Bhat, Gijo & Jnanesh 2014:614; Byrne et al. 2007:5; Laureani & Antony 2015:406; Snee 2010:12; Zhang et al. 2012:602-604). The automotive sector, which purports to be at the forefront of best industry manufacturing practices in South Africa, is certainly lacking in this area. It appears that business leaders in South Africa adopt various improvement techniques through consultants, government funding, industry sectors or support from global sister organisations, the latest being either Lean or Six Sigma techniques which are adopted mainly as standalone and used in isolation. On a closer examination of South African academic journals, relevant books, periodicals, newspaper articles, websites and consultation with various automotive manufacturers, there appears to be no indication to suggest that the automotive component manufacturing organisations in KwaZulu-Natal (KZN), South Africa, are considering the integrated Lean Six Sigma technique as an optimum business improvement strategy. This is confirmed by Zhang et al. (2012:604) who identified that the integrated Lean Six Sigma technique has only been executed in the education sector in South Africa. Therefore, an investigation is needed for the automotive sector in KZN to consider the application of the Lean Six Sigma tool to achieve better business results conceptually and operationally. The aim of this article is to determine how automotive component manufacturing organisations in KZN can improve their existing processes through the integrated Lean Six Sigma technique. To achieve this, the article will establish the consequence of integrating Lean and Six Sigma to complement and reinforce each other and develop a conceptual framework that integrates Lean and Six Sigma for automotive component manufacturing organisations in KZN, South Africa. In the next section, a brief literature review is provided on Lean and Six Sigma as standalone systems and then the rationale for combining Lean and Six Sigma as an integrated tool is presented. Thereafter, the research design and methodology section discusses how this study was executed. The results section provides an analysis of the empirical study and the key findings. The discussion section explains the operation of the proposed Lean Six Sigma framework. The article concludes with recommendations and also highlights some of the limitations and proposes future research. The purpose of the Lean technique is to eliminate waste from every possible process in an organisation. Typically, the different types of waste include overproduction of work-in-progress inventory, excess warehouse inventory, transportation of components, waiting for preceding processes, motion of unnecessary operations, inadequate processing steps, defects requiring rework, and unused employee creativity (Liker 2004:28-29; Pepper & Spedding 2010:139). The theory guiding the Lean technique is based on five principles which are as follows: defining value from a customer's perspective, identifying non-value-added activities in the value stream, creating continuous flow in all processes, establishing pull systems, and pursuing perfection (Andersson, Eriksson & Tortenson 2006:288; Morgan & Brenig-Jones 2009:15; Su, Chiang & Chang 2006:3). These principles are used in conjunction with specific Lean tools and methods to maximise the value-adding components in an organisation by using less human effort, space, and time to produce high-quality products as efficiently and economically as possible, while being highly responsive to customer demand. The intention of the Six Sigma technique is to remove variation from processes and strive to manufacture defect-free products. It is associated with the acronym DMAIC which stands for Define, Measure, Analyse, Improve, and Control. This serves as the foundation and systematic five-step problem-solving methodology that is followed to find causes of variation in system processes. The DMAIC cycle serves to define a process to improve, measure the baseline and target performance of the process, analyse the process data to determine the key process inputs that affect the outputs, improve the process to optimise the outputs, and, finally, to control the improved process for sustaining the improvement (Andersson et al. 2006:287; Foster 2010:429; Su et al. 2006:4). The Six Sigma team members apply sophisticated root-cause analysis techniques and statistical tools at each step of the DMAIC cycle to achieve continuous and breakthrough improvements towards solving a problem. At the forefront as standalone business improvement techniques, Lean and Six Sigma have different performance measures but are popular in assisting organisations that strive for operational excellence to compete globally. They are proven techniques that have a common goal towards continuous improvement but differ in their approach to meet these objectives. Although there are many success stories of performance improvements related to Lean and Six Sigma as standalone systems, there are also inherent weaknesses that have been identified for each technique over the years. 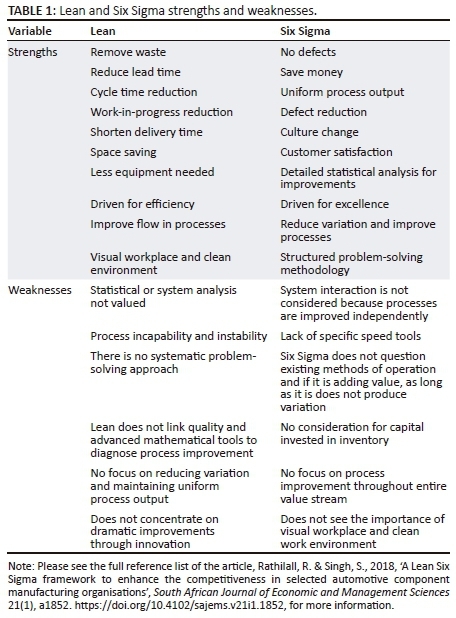 Table 1 summarises the strengths and weaknesses associated with Lean and Six Sigma as standalone systems and suggests how each technique on its own does not incorporate all the performance measures that are required to lead an organisation to perfection. From Table 1 the most significant weakness associated with Lean is that it does not incorporate the tools to reduce variation. Conversely, the most noticeable weakness of Six Sigma is that it does not attempt to develop a link between quality and speed as Lean does (Andersson et al. 2006:290-294; Su et al. 2006:2). 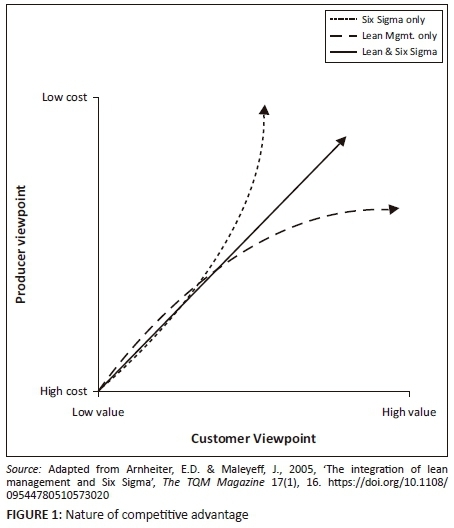 This rationale highlighted to the business world that conventional processes had limited aspects of both Lean and Six Sigma improvements and proposed the need for integrating these techniques to create a unified improvement approach with minimum weaknesses (Bhuiyan & Baghel 2005:765; Cabrita, Domingues & Requeijo 2015:223; Laureani & Antony 2015:406; Ndaita et al. 2015:686; Pepper & Spedding 2010:147; Salah, Rahim & Carretero 2010:251-252; Svensson et al. 2015:953). The logic of the integration was to capitalise on the strengths of both techniques and to account for the weaknesses of each technique as a standalone. The justification of the Lean Six Sigma integration is represented in Figure 1 to highlight the summary and nature of improvements that would be gained by combining the two techniques. H0: A relationship exists between the integration of Lean and Six Sigma and an increase in process performance. H1: A relationship does not exist between the integration of Lean and Six Sigma and an increase in process performance. The action-based research strategy in this article was accompanied by an empirical study. Sekaran (2006:36) suggests that action research is generally undertaken to substantiate change processes within organisations which, in this instance, was aligned with the objective of developing a Lean Six Sigma framework in the KZN context. The study incorporated quantitative techniques as the methodology to validate the research objectives. The initial step was to systematically investigate what unique performance measures Lean and Six Sigma offered the business world when adopted independently. Thereafter, the article examined the strengths and weaknesses between Lean and Six Sigma as standalone systems in order to validate the impetus for combining them into an integrated business improvement tool. This part of the article was exploratory in nature and concluded that although Lean and Six Sigma had unique strengths as standalone systems, their weaknesses on the other hand complemented each other to increase process performance. The next phase of the study performed the field work to collect primary data. This part of the study incorporated a self-developed survey questionnaire in measurable format to gather practical information from the sample organisations on the status of their existing business improvement programmes and quality practices. The survey method was deemed appropriate for gathering primary research data due to its flexibility in being custom designed to meet the objectives of any research project (Sekaran 2006:236). Lastly, explanatory analysis was applied during the construction of the Lean Six Sigma framework as suggested by Terre Blanche, Durrheim and Painter (2006:44). The results of this study are applicable to organisations within the DAC and may not be generalised to all organisations in South Africa; however, the findings may be useful to organisations that have implemented or are implementing Lean, Six Sigma or Lean Six Sigma. The questionnaire was derived from literature that were closely linked with survey type questions developed by other researchers such as Pulakanam and Voges (2010: 158-161), Zu, Fredendall and Douglas (2008:645-648) and Shah and Ward (2007:803). The choice of these studies showed that the developed scales and questions had an accurate measure of validity and reliability and highlighted key variables that were required for Lean and Six Sigma techniques which were deemed to be justifiable in this study. Douglas, Douglas and Ochieng (2015:775) used a similar approach in their study in various service and manufacturing organisations in East Africa. The structure of the questionnaire was based on the following categories: organisations that practise the Lean technique as a standalone system, organisations that practise the Six Sigma technique as a standalone system, Lean Six Sigma critical success factors, and usage of different tools and techniques. The study adopted both open-ended and close-ended questions in the questionnaire design. The closed-ended questions were designed on a five-point Likert scale ranging from 'Do not agree at all' (1) to 'Agree fully' (5). Since this survey assessed practical experience and knowledge instead of general perceptions, the target participants included operations managers, quality managers, production system managers, Six Sigma experts and Lean specialists who were knowledgeable and familiar with the terminology and their processes. Census sampling was adopted as it involved all organisations in the DAC and because the population size was smaller than 50 as suggested by Saunders, Lewis and Thornhill (2009:243). According to the sample size determinator from the Stat Graphics statistical package software, a 95% level of confidence indicates an appropriate sample size of 30 (Singh 2011:1622). It is also highlighted in literature that statistical analysis usually requires a minimum sample size of 30 elements for investigation (Saunders et al. 2009:243). There were 42 organisations within the DAC at the time of conducting the survey; however, only 32 (75%) participants completed the questionnaires. This was sufficient to adopt certain statistical analysis techniques and validate conclusions from the findings. The Statistical Package for Social Sciences (SPSS) version 20.0 was used to process and analyse the data obtained from the questionnaires. Each quantitative question was analysed individually in terms of reliability, content, and the frequency of responses. Internal, external, construct, and content validity checks were performed to verify the measuring instrument while the Cronbach's alpha test confirmed the reliability. Frequencies and means were used to describe the data by investigating the distribution of the scores of each variable and by determining whether the scores on the different variables are related to each other as suggested by Terre Blanche et al. (2006:558). The mean scores are independent for Lean and Six Sigma organisations. In an attempt to understand the variation in responses, the percentages of the three categories of results are presented as follows: organisations that practise neither technique, organisations that practise Lean only and organisations that practise Lean and Six Sigma as standalone systems. The levels of disagreement (negative statements) were collapsed to show a single category of disagreement. A similar procedure was followed for the levels of agreement (positive statements) to show a single category of agreement. In this manner, only three categories of results in percentage form are presented as 'disagree' (D), 'neutral' (N) and 'agree' (A). This is allowed due to the acceptable levels of reliability and consistency in the factor analysis. Gap analysis was used to evaluate the difference between the desired operating levels versus the existing operating level of the critical success factors of Lean Six Sigma in the sample organisations (Foster 2010:163). The gap values represented the difference between the actual mean score and the hypothesised perfect score of 5. This implies that mean scores above 3 indicate that the questions were positively answered. Reason for this dichotomy would enhance the results. The communality for a given variable, according to Kinnear and Gray (2009:568), can be interpreted as the total proportion of its variation that is accounted for by the extracted factors. In the case of this study, the questionnaire model is acceptable as it explains approximately 70% of the variation for the 54 variables in the Lean Six Sigma critical success factors section. The Pearson's Chi-squared test was performed to determine whether there were statistically significant relationships between the variables in this study. As suggested by Kinnear and Gray (2009:409) a p-value is generated from a test statistic with a significant result indicated by 'p < 0.05'. The null hypothesis is used for testing and it is a proposition that states a definitive and exact relationship exists between two variables. The alternative hypothesis is the logical opposite of the null hypothesis and is a statement expressing a relationship between two variables or indicating differences between groups (Sekaran 2006:105). The p-values in the main study indicated that there are differences (that are not due to chance) between each statement and the respective category. The positive feedback from the participants indicated that the Lean technique as a standalone system included simple tools such as 5S and Standardisation which is easy to understand and apply by the operators. The results engage with Gupta (2005:426) that Lean promotes better housekeeping, more organised workspace, higher inventory turnover, and motivated employees. However, some of the common limitations extracted from the participants revealed that more focus was required in reducing defects and customer complaints, creating a structured problem-solving approach and maintaining stable processes. This gives an indication that Lean as a standalone technique has limitations in improving an organisation's performance. These limitations are the key focus areas that the Six Sigma technique can improve, which is also highlighted in the literature (Arnheiter & Maleyeff 2005:17; Thomas, Barton & Chuke-Okafor 2009:114). This suggests that an organisation that operates with the Lean technique as a standalone system does not necessarily consider the importance of reducing process variation. Therefore, it can be regarded as the opportunity or building block for embracing a possible integrated Lean Six Sigma technique. There were no organisations that practised Six Sigma 'only' as a standalone system. It appears that these organisations either practised some form of Lean initially and then selected Six Sigma techniques into their operations later for additional improvement, or practised Six Sigma initially and then included Lean techniques for further improvements. However, in terms of the responses towards Six Sigma as a standalone system, several of the participants indicated that it is a high-level process for advanced problem-solving. They claimed that the statistical and mathematical tools make it difficult for the average employee on the shop floor to utilise. Another common theme that arose among the participants is that Six Sigma is a good systematic problem-solving tool that is similar to the Plan Do Check Act (PDCA) cycle. Other responses included that Six Sigma as a standalone system does not focus on reducing inventory, 'on time' delivery performance, identifying non-value-added activities, and reducing cycle times. It can be inferred from these comments that there is acceptance from organisations that there is an existing gap of meeting other organisational performance measures after they implemented Six Sigma as a standalone system. This is possibly the reason for their introduction of Lean to their organisations. The results of the analysis mean that Six Sigma as a standalone system has limitations which can favourably be addressed by the Lean technique; this therefore corresponds with Thomas et al. (2009:114) and Arnheiter and Maleyeff (2005:17-18) that in order to increase process performance, Lean may be needed to work in conjunction with Six Sigma. The results for organisational infrastructure are presented in Table 2. It can be noted from Table 2 that questions 1.1, 1.2, and 1.5 showed smaller mean values (less than 3). For question 1.1, the striking observation is that the majority of organisations that practise neither technique 'disagreed' with the statement which contests what Liker (2004:152) argue: that clearly defined processes and procedures allow employees to understand their roles and responsibilities within predefined limits and are the strategic link between the organisation's vision and day-to-day operations. This could possibly imply that organisations that have undefined processes and procedures will have insufficient control mechanisms in place to manage their daily operations. The high level of 'agreement' for question 1.2 is within organisations that practised the Six Sigma technique and is congruent with Banuelas et al. (2006:514) that the Six Sigma technique increases an organisation's focus towards its strategic objectives to sustain a competitive advantage in the business world. This means that organisations that strategically manage the business are able to increase their operational effectiveness by increasing sales, profits and efficiency. For question 1.5, there is a consistent trend of 'agreement' within organisations that have improvement systems in place; this corroborates the findings of Shah, Chandrasekaran and Linderman (2008:6683) who espouse that the Lean and Six Sigma techniques consciously engage employees to continuously improve their processes on an ongoing basis. The results for management commitment and leadership are presented in Table 3. With the exception of question 2.2 in Table 3, all other questions have significant gaps in this section. The substantial level of 'disagreement' for question 2.1 could possibly be reflecting personal feelings of the participants who are probably not motivated by management, which correlates with the findings of Sim and Rogers (2009:37-46) who found that shop floor employees (referred to as operators) do not believe that the organisation views them as the most important asset and believes that they require constant motivation. Organisations that have improvement systems in place positively 'agreed' with question 2.3, which indicates that management sees the benefit of frequently making their way to the production environment, which coincides with Salah et al. (2010:270) that managers continuously visiting the workplace allows them to identify opportunities for improvement on an ongoing basis. For question 2.4, the largest portion of 'agreement' stems from organisations that practise the Six Sigma technique. 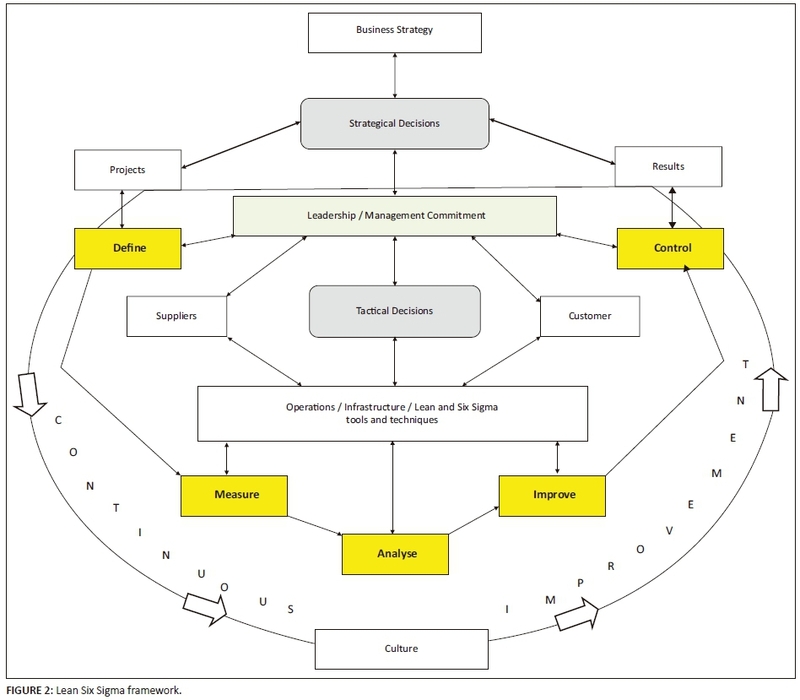 This concurs with the views of Savolainen and Haikonen (2007:9) that Six Sigma requires the development of a hierarchy of process improvement specialists who are equipped with the tools and knowledge to make significant improvements in the business. Since question 2.5 relates to improving employees' morale and reducing their confusion in terms of expectations and current performance, the general trend of 'agreement' can be related to the work of De Koning et al. (2008:41) who found that consistent feedback assists employees to enhance their performance and prevent repetition of errors. The results for commitment to quality are depicted in Table 4. It is evident from Table 4 that questions 3.1, 3.3 and 3.5 have large gaps in this section. The negative responses for question 3.1 could mean that top management relies on their subordinates to assume the responsibility of quality performance which is consistent with Lee and Peccei (2008:5) who articulate that the traditional organisational perspective required specialists to solve quality problems. The positive results for question 3.3 could be reflecting responses that are related to training of employees on basic quality principles, while the negative and neutral responses on the other hand could be referring to organisations that do not use statistical techniques or do not see the potential benefits of statistical tools as also suggested by Thomas et al. (2009:116-117). Since organisations that practise neither technique reveal a high level of 'disagreement' and 'uncertainty' for question 3.5, it would appear that they may not have formal quality systems in place to manage quality. This contradicts the findings of Zu et al. (2008:636) who maintain that quality data is essential to provide accurate and timely information for product quality and process performance. The results for production control are demonstrated in Table 5. It is observed that the focal gaps in Table 5 were identified for questions 4.1, 4.2, 4.3, 4.4, 4.5, and 4.6. Since the Pull system is a Lean tool, it is understandable that organisations that practise neither technique will have a high level of 'disagreement' for question 4.1. The positive results from organisations that practise the Lean technique indicate that they require minimum stock levels throughout the supply chain, which is aligned with the suggestion that the Pull system was created to prevent an organisation from manufacturing products in advance and storing unnecessary stock (Andersson et al. 2006:288). Question 4.2 indicates a high level of 'agreement' within organisations that practise the Lean technique, which is aligned with Liker (2004:23) that the Just-in-time (JIT) production system enables an organisation to manufacture and deliver products in smaller quantities and at reduced lead times to meet specific customer requirements. Organisations that 'disagreed' with this statement could possibly manufacture products in excessive amounts and store unnecessarily. As expected, the extent of 'disagreement' depicted in question 4.3 for Kanban application is similar to that of the Pull system and they mirror each other closely. This makes sense, since a Kanban system is the classical signalling device for Pull production as highlighted by Bhasin and Burcher (2006:57). For question 4.4, the high sentiment of 'agreement' within organisations that practise the Lean technique aligns with Bhasin and Burcher (2006:57) that manufacturing 'cells' group selected employees, machines, and operational processes into an independent operational unit to manufacture a complete product from start to finish in a single process flow. The organisations that 'disagreed' with question 4.5 imply that they probably find it difficult to accurately forecast customer demands. This is supported by Liker (2004:116-117) who documents that since customers do not purchase products in a sequence, it is difficult to predict their requirements and manufacture products accordingly. Since there are no restrictions for implementing the SMED technique, the findings of 'disagreement' for question 4.6 contradicts the view of Santos, Wysk and Torres (2006:140-145) who claim that it is possible to achieve effective machine changeover without costly investments since the SMED technique seeks to eliminate the use of screws and nuts as the fixing elements. The results for process improvement are illustrated in Table 6. It is noted in Table 6 that questions 5.1, 5.3, 5.4, 5.5, 5.8 and 5.9 have significant gaps in this section. For question 5.1, the high level of 'disagreement' stems from organisations that practise neither technique. It can be interpreted that these organisations do not understand the application of 'poka yoke' devices, which is deduced from the readings of Chase, Jacobs and Aquilano (2006:333). Since the sophisticated tools of Six Sigma cannot be embraced by the average employee on the shop floor, it can be interpreted from the general trend of 'disagreement' for question 5.3 that many organisations do not pursue the implementation of statistical process control in the context of Six Sigma. The positive results (Lean and Six Sigma organisations) for question 5.4 show alignment with the thinking that Six Sigma improvement projects are evaluated from a financial perspective using measures such as cost savings or increased revenue and non-financial benefits such as the impact the project has on customers (Evans & Lindsay 2005:66-69). The majority of 'disagreement' (organisations that do not practise the Six Sigma technique) for question 5.5 could mean that these organisations undertake problem-solving intuitively and do not believe that improvement projects should be structured and undertaken systematically. For question 5.8, the high level of 'agreement' (Lean organisations) is aligned with Schroeder (2007:409) and Chase et al. (2006:473) that the value stream investigation represents material and information flow for improvement opportunities. The positive responses for question 5.9 (Lean organisations) seem to be in line with the findings from literature that the central focus of Lean is to create more value for customers by eliminating activities that do not add value to a product or service (Karthi et al. 2011:310; Pepper & Spedding 2010:139). The results for employee involvement are summarised in Table 7. Given the emphasis on people issues in literature, the negative responses to questions 6.1, 6.2, 6.4, 6.6, 6.7, 6.8, 6.9, and 6.10 in Table 7 supplement the scoring pattern. For question 6.1, the high level of 'disagreement' could possibly be attributed to shop floor employees not having the technical knowledge of working with complex problems. In such circumstances, it can be suggested that shop floor employees be exposed to problem-solving techniques that are directly related to their processes. The high content of 'disagreement' (organisations that practise neither technique) for question 6.2 reveals that the shop floor employees within these organisations do not believe that they are responsible for identifying defects, which verifies the views of Santos et al. (2006:78) who are firm in their belief that operators are able to make unintentional errors during inspection and, therefore, would not like to be held responsible for performing quality checks. For question 6.4, the positive responses (Lean organisations) can be related to the work of Schroeder (2007:403) who advises that multifunctional teams in Lean organisations do not assume productive tasks only but also indirect functions such as quality control and general maintenance of equipment. The consequence of suggestions not being implemented could validate the high sentiment of 'disagreement' for question 6.6; this contradicts the views of Bhuiyan and Baghel (2005:766) who contend that employees should be given explanations for suggestions that are rejected. The high level of 'disagreement' for question 6.7 contradicts the views of Comm and Mathaisel (2005:136) who suggest that when employees are given permission and tools to make changes in processes, they should also be appropriately recognised for their initiatives towards quality improvement. The negative responses to question 6.8 could imply that the employees do not perform work tasks outside the traditional boundaries of their original training and this results in limited workforce flexibility in these organisations. Since the objective of training is to enhance the employee's skills, the results for question 6.9 indicate that 50% of the organisations have a high level of skilled employees who are adequately trained to perform their functions. This correlates with Comm and Mathaisel (2005:136) who articulate that as long as organisations provide proper training it allows employees to understand their process as well as the processes before and after in the product flow. The positive responses for question 6.10 could mean that the participants view teamwork as an important competitive strategy; this correlates with Evans and Lindsay (2005:15) that teamwork focuses attention on building customer and supplier relationships and encourages the involvement of the total workforce. The results for customer focus are reflected in Table 8. It is noticeable in Table 8 that questions 7.2 and 7.5 have significant focal gaps in this section. The majority of the positive responses (Lean and Six Sigma organisations) to question 7.2 concurs with Delgado, Ferreira and Branco (2010:518) that the Voice of the Customer (VOC) describes what customers require and their perceptions of how well the products or services meet their needs. For question 7.5, the positive responses are consistent with Morgan and Brenig-Jones (2009:23-24) that the customers' Critical to Quality (CTQ) characteristics provide the basis for the organisation to determine which process measures are critical. On the other hand, the portion of 'disagreement' could imply that if the customers CTQs are not investigated immediately, the relationship may become strained and they would be attracted to the competition. The participants' feedback in this section revealed that problem-solving and Lean tools are commonly used among the organisations as compared to statistical tools. The results strengthen the findings of Antony et al. (2007:301) who identified similar trends in UK organisations. This is also supported by Albliwi et al. (2015:679-686) who in addition identified that most organisations in UK and Europe prefer Lean tools while the Six Sigma tools are more popular in the American manufacturing sector. It is reasonable to conclude that since problem-solving and Lean tools offer visual representation of problems and are easier to use, they appeal more to the organisations than the sophisticated and complex statistical tools of Six Sigma. A similar trend was established in East African organisations (Douglas et al. 2015:777). The empirical evidence of this study showed proof from a KZN perspective that Lean and Six Sigma have limitations as standalone systems and thus justified the need for uniting these techniques. Therefore, the null hypothesis is accepted that a relationship does exist between the integration of Lean and Six Sigma to increase process performance. The hypothesis is supported from the results of the Chi-squared p-values and gap scores which indicated that the weaknesses of each technique are complemented by the strengths of the other technique. The above conclusions are consistent with the authors that have tested the effectiveness of the integrated approach on many occasions, which is evident from cited literature and case studies (Delgado et al. 2010:518; Douglas et al. 2015:779; Ndaita et al. 2015:689; Svensson et al. 2015:967; Thomas et al. 2009:125-127). The proposed framework in Figure 2 depicts how organisations should initially develop their strategic decisions and then translate them into suitable projects that will facilitate continuous improvement. The selected projects need to be fully supported by the organisations' leadership and management commitment to ensure success. Douglas et al. (2015:778-779) demonstrated breakthrough results of Lean Six Sigma deployment in East Africa through effective leadership and management commitment. Similar results were established in Kenya (Ndaita et al. 2015:689), India (Bhat et al. 2014:637), south-eastern Europe (Psychogios, Atanasovski & Tsironis 2012:129) and Portugal (Delgado et al. 2010:521). When the projects are handed over to the operational level, it is followed through with the DMAIC cycle. Cabrita et al. (2015:224) state that the DMAIC cycle is a robust methodology that can prevent the creation of hasty conclusions and provide an adequate investigation of alternate solutions to a given project. This part of the framework is tactical as it aligns supplier commitment and customer satisfaction directly to the operational activities. The operational activities include the infrastructure and selection of the correct tools for each step of the DMAIC cycle as represented in Table 9. From Table 9 it can be surmised that the adoption of the 5S tool and Standardisation at the Define phase will ensure that the processes are clean and standardised before investigating the process or product for improvement opportunities. Thereafter, Value Stream Mapping will identify value-added and non-value-added activities throughout the value stream. The investigation of Cycle time and Process yield in the Measure phase will ensure that the efficiency of the process is analysed. The adoption of Constraints measurement, Production Levelling and Takt time evaluation at the Analyse phase will produce better cause and effect relationships between process and product characteristics. For example, the investigation of long cycle times and waiting times will ensure that maximum operating conditions are generated from each process. This will establish better Flow conditions between processes without interruptions. For the Improve stage, the addition of future state Value Stream Maps, Continuous Flow, JIT, Kanban and Pull systems will establish more efficient process flow with capable processes. It should be noted that the interaction between the current and future state Value Stream Maps can provide an opportunity to effectively monitor the progress of the Measure, Analyse and Improve phases of the DMAIC cycle. Lastly, the adoption of SMED, TPM, Cell manufacturing, Visual controls and 'poka yoke' devices at the Control phase will maintain a highly efficient and effective workplace and sustained customer focus. The wide range of tools associated with the proposed framework allows employees the opportunity to select the best suited tool for each step of the improvement process as also established by Douglas et al. (2015:779) in East Africa and Svensson et al. (2015:959) in Saudi Arabia. In terms of cultural changes, the KZN business climate consists of complex and diverse employees; this diversity makes it difficult to capitalise on the human dimensions that are required for Lean Six Sigma application and effectiveness. This can be overcome with an appropriate organisational infrastructure and a quality-driven culture that are required to change from passive support to proactive participation and learning. Therefore, it is recommended that management develop an open, honest and transparent quality-driven culture among employees as a means of ensuring the system works effectively. This was also demonstrated in Portugal (Cabrita et al. 2015:229), East Africa (Douglas et al. 2015:778), Kenya (Ndaita et al. 2015:689), India (Bhat et al. 2014:638) and south-eastern Europe (Psychogios et al. 2012:134-136). The completion of each project is determined by the results achieved to establish if the initial strategic decisions have been satisfied. Svensson et al. (2015:967) suggest that management set up structured performance evaluators and follow-up procedures to continually monitor the progress of Lean Six Sigma projects to ensure sustainability of the system. The integrated and step-based implementation methodology of the framework provides leverage for organisations to capture a coherent and holistic approach towards continuous improvement. The study concluded that there are performance gaps evident in the processes with regard to some of the essential Lean and Six Sigma tools and techniques that are practised on the shop floor compared to the theoretical requirements in the organisations investigated. These tools and techniques are directly linked to the critical success factors of the Lean Six Sigma approach and can thus have an adverse effect on the implementation of the proposed Lean Six Sigma framework if it is not managed effectively. Therefore, it is suggested that organisations pay closer attention to the improvement opportunities for each of the seven critical success factors as represented in Table 10. This could represent the checklist to improve the current manufacturing processes within the organisations under study. The specific improvements in Table 10 are supported by Shah et al. (2008:6696) who suggest that organisations need to carefully assess their current manufacturing processes and capabilities before implementing another technique, and achieving success. In this regard, if an organisation wants continual improvement, it needs to recognise that there are significant interactions between their management system and the improvement technique. When the organisations understand the characteristics of the environment in which they operate, it will ensure that they configure appropriate follow-up processes to sustain their management systems. The critical success factors highlighted in Table 10 are applicable to all organisations and can therefore be integrated into any management system to achieve better performance measures. It also provides KZN managers with a checklist for monitoring and measuring the current improvement processes on the shop floor so that it leads to predictable results. It is anticipated that once effective corrective actions are taken for the problem areas identified, it will make it easier to implement the proposed Lean Six Sigma framework from an application perspective. Although this study enriches the literature by providing in-depth information on the reasons for combining the Lean and Six Sigma techniques, some concerns and limitations have been identified through the research process. The limitations of this study were as follows: only organisations in the KZN automotive sector were used in the investigation, there was minimum usage of the Lean Six Sigma technique in South Africa, no organisations practised the Six Sigma technique as a standalone system, and the proposed Lean Six Sigma framework could not be tested. These limitations, however, provide inspiration for potential future research activities such as extending the research into the entire geographical diversity of the South African automotive sector to learn more about other organisations that claim to practise Six Sigma independently and rank their existing state, and testing the validity of the proposed Lean Six Sigma framework in a real case application to ensure that the critical outcomes are adequately ingrained to increase process performance. It should be noted that even if an organisation claims to have improvement systems in place, there are always opportunities to further improve its performance. Therefore the proposed Lean Six Sigma framework in this study affords the KZN automotive sector a unique opportunity to create its own brand of quality that complements its management style and industry demands. It forms a powerful business strategy that can assist the KZN automotive industry to become the very best in confronting local and global challenges. R.R. contributed to the literature review, methodology design, data collection and analysis, and article compilation. S.S. provided the supervision throughout the study.